A welcome awaits anyone who would like to join our small group of folk for a local walk, we meet outside the Vestry Door at 1pm and usually end up at a coffee shop!. transport is provided if necessary. 24th February 2008was a beautiful sunny day once again for our walk, this was the Coffin Walk from Breaston Square through to Draycott and back again. 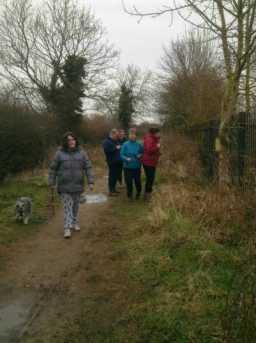 After our 4.5 miles we enjoyed a sit down and a very welcome drink in the Deli at the back of Breaston Church. We take our walks at a leisurely pace enjoying one another's company and soaking up the scenery, come and join us if you can! Picture courtesy of 'walking' photographer. 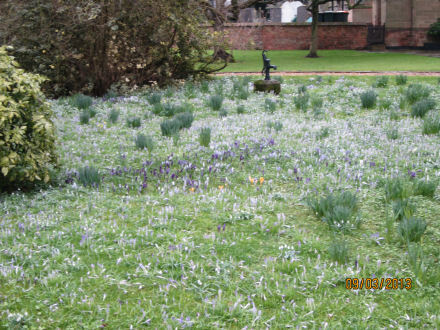 9th March 2013 saw six of us and one dog had a brisk walk from Attenborough car park to a very welcome stop at Beeston Marina Boathouse Cafe before and equally brisk walk back past the beautiful snowdrops at St Mary's Church. Saturday 23rd October 2010 - 5 of us enjoyed a pleasant walk round part of Attenborough Nature Reserve and yes as usual it rained on us! It was not too bad though and we rounded it off nicely with a hot drink in the Visitors Centre. We were also privileged to see a Peregrine Falcon, alas no camera to hand! Saturday 26th July 2008 was quite a hot afternoon. 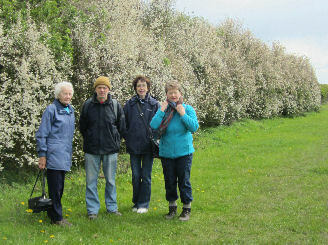 4 of us decided to opt for a cool walk among the trees at Attenborough Nature Reserve. It was glorious and at one point we stopped to sit on a bench overlooking one of the ponds and watched young herons bobbing their heads up and down in tree tops in a nest on an island in front of us, great, and the scenery was splendid, we were so fortunate. A wonderful tranquil spot 'just down the road' as it were. Unfortunately none of us had a camera, we really must try to do something about that! Finally we had a well deserved cup of tea/coffee at the Visitors' Centre. 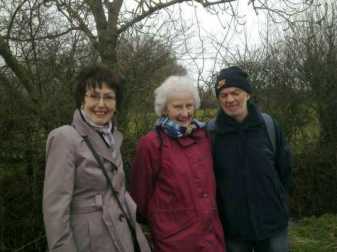 23rd February 2013 eight of us set off in ice rain to walk around Ilkeston. We did have to thaw out over a hot drink at Trowell Garden Centre! 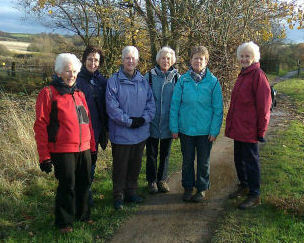 17th November 2012, eight of us enjoyed a sunny walk around Risley, culminating in a great hot drink at Andersons Breaston. 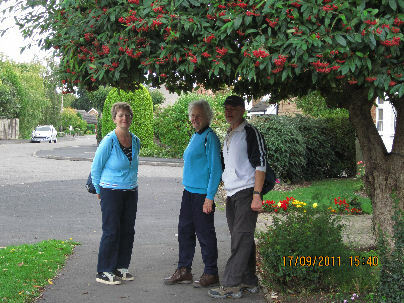 17th September 2011 started out wet but turned into a great afternoon and 4 of us took 'The Coffin Walk' round Breaston and despite one or two clouds towards the end it did not rain. A well earned rest and drink was taken at the Pumpkinz Gift and Coffee Shop Draycott before the last walk back. 21st April 2012 saw five of us take a circular walk from Breaston round Risley and back again, despite all the wet weather we are currently 'enjoying' it did not rain all afternoon, weren't we the lucky ones! 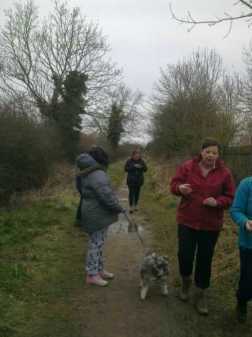 At the end of our walk a well earned hot drink was enjoyed by everyone. We are so lucky around here we do not have to go far to find some wonderful countryside views. 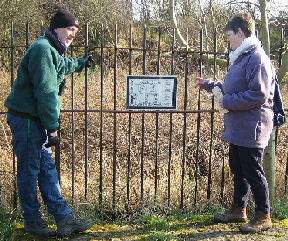 On Saturday 19th April 2008, following a visit to the Long Eaton Art Group's Exhibition in the School Room, 4 of us set off and walked down to the Canal Bridge and followed the tow path to Trent Lock in beautiful sunshine. Having promised ourselves a nice hot drink at the Tea Rooms we were a little dismayed to find it shut, but no matter a nice hot drink was available from the Steamboat and we sat outside in the sun to enjoy it. Feeling suitably refreshed we set off again and followed the canal path round past the moorings to Cranfleet Lock and then took the path to Trent Meadows on our way back to Long Eaton. 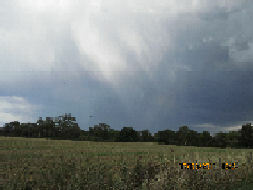 Weather and company were most enjoyable. Sorry no pictures this time our 'walking' photographer was on holiday! 18th May 2013 Once again a small band of us enjoyed a walk to Beeston Marina with a stop for refreshment, and a time of fellowship. 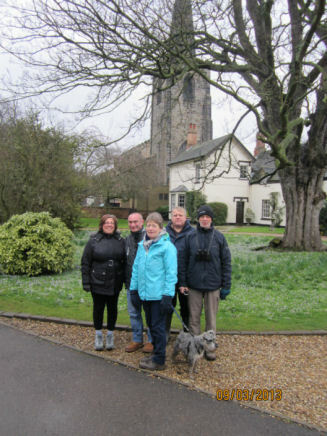 13th April and nine of us and one dog (musn't forget the dog) enjoyed and pleasant walk around Breaston and yes we did end up having a nice hot drink at the end. Come and join us, watch this page for dates! 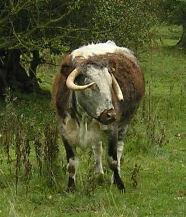 25th October 2008 saw a cold wet day dawn but this did not stop 7 of us from taking a walk from Ticknall which took us round Calke Abbey past the beautiful avenue of autumn coloured trees and up by the house, along the by the lake and back through the dark, dank uneven floored tunnel! The afternoons weather although drizzly and overcast did not wet us through as expected! A nice hot drink was very welcome as we stopped at the Tea Rooms on our travels.